I’ve been watching the platform ever since I discovered it, back in the days where people made lyric videos in comic sans and had names like ‘littlemisspinksparkles1467xxx’. Since the very first days of Shane Dawson, who I was way too young to watch and other big YouTube ‘celebrities’. It’s so easy to get lost in cyber space watching hilarious vine threads (R.I.P Vine), or a new ‘YouTube drama’ but over the past few months I’ve been looking at who and what I’m watching on YouTube and thinking about it from a mindful point of view, asking questions like; ‘Does this bring me joy to watch?’, ‘Is this helping me to develop and grow?’, ‘Am I intentionally watching this content?’ and I must say that I’ve culled a few channels from my subscription feed but now the videos that arrive in there aren’t just skipped over. I’ve found I’m watching 9/10 videos in my feed and that missing 1 is usually because I love the channel, just not interested in the video. This was the first channel that really got me interested in veganism, minimalism, mindfulness and sustainability and really showed me a whole other lifestyle that really fits with things I believe in. It’s not for everyone but her energy is genuinely contagious and after watching her content I feel like I can do anything I want to if I truly believed I could. Her channel has opened the door to so many others that I watch and has challenged me with questions about my lifestyle and morals that I find myself genuinely excited to see her latest video pop into my feed. Through Raw Alignment I went on a hunt for all channels to do with mindfulness and minimalism and found MuchelleB! She’s super stylish and makes short videos about how to improve yourself every day, whether that’s by tidying up KonMari style, how to make a to-do list and stick with it or simply how to get out of a bit of a slump and turn a bad day around. She presents herself as super chill and again, I come away after 3-5 minutes of her content feeling like I can be a better person day after day. Here’s where I may lose a few of you down a dark and controversial internet wormhole but KendallRae does amazing videos with content ranging from missing people cases, astrology, vlogs and conspiracy theories. I don’t know why I have such an interest in all those subject areas but her channel is the perfect mix of them all and I have to admit that when I first found her channel, I did go on a huge binge-watching session! She’s just so great and it seems like everyone has jumped on the conspiracy band-wagon lately but she’s still one of the top out there! One of very few I have followed since back in the day, when she was creating ‘how to wear side bangs’ videos and now she creates the most beautiful vlogs I’ve ever watched (and I’ve watched a lot! ), just everything from camera shots to how she edits it genuinely makes my soul happy! Some people on YouTube are successful because they follow trends or get involved in drama but Monica, is known for her beautiful vlogs! Now I never used to enjoy his content but it’s come a long way. It’s a news channel – not drama news, proper news, which is unusual for YouTube. He covers all kinds of topics, both within the platform and in the mainstream media. I loved his coverage of the American Campaign because he truly does provide both sides to an argument. Not only that but he actively encourages people to go and do their own and more research, not just rely on him or one other news source. He doesn’t just cover american news either but anything international that becomes huge news, for example, he covered the British Election a couple of months ago. 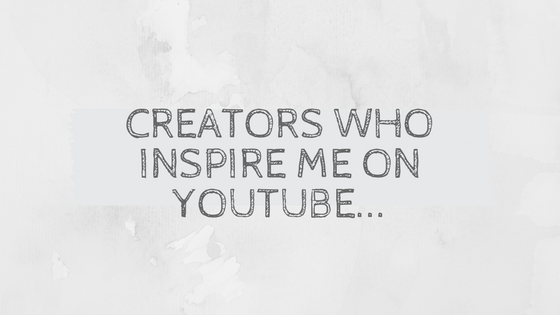 Do you watch YouTube creators? What do you think about them? Who’s your top 5? What’re your ‘go-to’ topics? Leave a comment down below – lets start a conversation!